What’s there to do on Bonaire? Bonaire, best known for being the Diver’s Paradise and Windsurf heaven, offers a plethora of other activities to please the outdoor enthusiast. With a myriad of tours and trips, one can be busy day and night. Bonaire’s waters are protected by the marine park. The mangroves, many located in Lac Bay, are also protected as they are breeding ground for the island’s sea life. Several companies offer kayak tours in and around the mangrove. Slowly glide through the tranquil waters. Later snorkel seeing juvenile barracudas and upside down jellies. Allow yourself time to enjoy this solitary experience in nature’s undersea nursery for a multitude of sea creatures. My favorite snorkel sites include Andrea I and south of Invisibles. Bird watching is another attraction. Island-based naturalists can take you on guided tours to see the Bonairean Parrot, Flamingos, Trupials, and Ruby Topaz Hummingbird, and the Tropical Mockingbird. Jerry Ligon, our island’s bird expert provides a unique glimpse into the unique habitat on Bonaire. Birding with Jerry is one of my favorite non water activities on Bonaire. The biggest thrill for me was sighting a Scarlet Tanager July 2008. What a thrill and indeed a late sighting. Hikers will be thrilled with the diverse options. My favorite hike, Ruta Dos Pos, takes you through the wild countryside of Bonaire on well marked trails. Every tourist who goes with me loves this late afternoon activity. The trail is for intermediate hikers and takes 1-1.5 hours. The trail takes you past a fruit plantation, Dos Pos–the local water source for neighboring farmers, and a myriad of animal life. If you are quiet, you will catch a glimpse of the wild pigs locally known as porko di mondi. See Watapana trees, a massive Tamarind tree, and some amazing rocks and geological formations. Cactus is plentiful with many varieties seen on this hike. In the distance near the peak you may see Lake Goto. Listen to the songs of the small chuchubi bird or the squawking prikichi. This is by far my favorite activity on Bonaire. Washington Slagbaai National Park is the first nature sanctuary of the Netherland Antilles. It was established in 1969 and covers an area of 6.543 hectares. Many activities can be enjoyed including diving, snorkeling, mountain biking, and hiking. There are 3 hiking trails in Washington Park. The Subi Branderis hike must be started early in the day as the temperature grows as the day passes. It is a 45 minute hike to the highest peak which is 784 feet high. On a clear day one can view Curacao and the mountain range south of Puerto Cabello in Venezuela. The other trails are less challenging, but offer uneven terrain making for a challenge. Another popular activity taking shape in Bonaire is mountain biking. Local guides offer races, tours, and trips along a variety of trails. The sun and wind make for a great challenge for the biking enthusiast. Washington Park offers challenging course. The roads and scenery of the park make it a great ride for mountain bikers. The tour, which is 34 km (21 miles) long, has a great variety of views and terrain. Long stretches of flat roads beside the sea contrast with severe up and down hills between mountains. This tour is for the advanced biker–people used to biking regularly; do not attempt it if you aren’t in good shape. Although the highest altitude on the bike route is only about 100m / 333feet, temperatures get very high and the terrain is rough. One of the coolest new water sports to hit the mainstream is Stand Up Paddle Boarding. Also called SUP, this new floaty board is all the rage from coast to coast. Now SUP hits the shores of Bonaire when Bonaire Starboard sponsored me to be a SUP spokesperson on the island . I love my 12’6 SUP. Recently reviewed in the Boards UK Board Test, the 12’6 received stellar reviews. Stand Up Paddle Boarding can be traced back to the old days in Polynesia. In the 1940s, Waikiki Beach Life Guards used to stand on their surf boards paddling around to patrol the beaches. The craze caught on and is big. Recently there was a SUP competition put on by John Hibbard in the UK. Facebook, the popular internet social program, has a SUP group as well. Almost every board company now fabricates and sells a version of the SUP. Other activities to do include caving, parasailing, geocaching, kiting, rappelling down a lighthouse, and, of course, boat tours and trips. 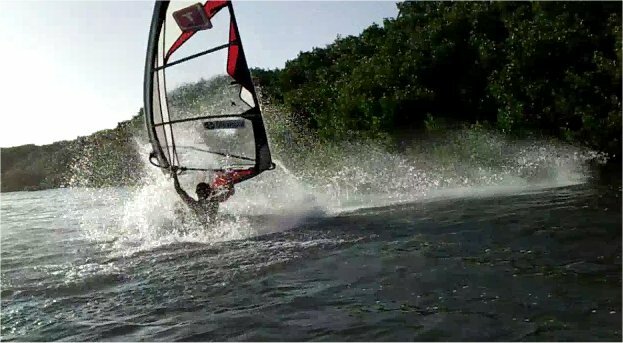 Bonaire’s perfect climate for water and nature sports make this island perfect for the outdoor lover. The picture enclosed is Spelunk cave.